"Scrapbook Play with Photos" + a Freebie + a Give-Away! 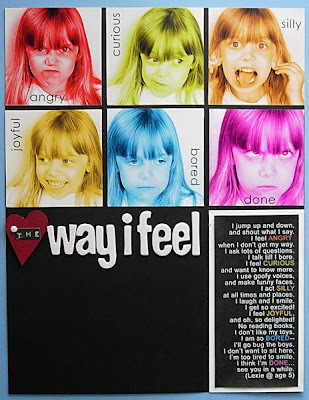 One of my favorite idea books is Scrapbook Play published by Simple Scrapbooks in 2007…remember that one? Those were some of the most creative and fun scrapping prompts ever. Well, when I found out they were publishing a “sequel” this year I was so excited! Scrapbook Play with Photos is loaded with creative and playful prompts to inspire you to embellish, alter, and give more emphasis to your photos. There are 126 prompts with adorable example layouts, plus 19 more without layouts at the end. Each prompt includes tips, variations on the prompts, and page references to related ideas in the book. Also included are quotes, random fun facts, games, and links back to their website for free downloads and additional info. It is full of some of my all time favorite designers and believe me, they don’t disappoint! - 145 photo play ideas…at under $10 you sure get your money’s worth with this special issue! - All of the ideas look wonderful and adorable, but totally doable. Nothing seems overwhelming or too difficult. - There is a variety of photo projects, not only scrapbook pages. - There are a few ideas using digital techniques, but I really wish there were more. There are a lot of simple digital products (actions, photo frames, brushes, word art, etc) that even traditional scrappers can easily use to enhance a photo. *For this layout I followed prompt 67: Use a border punch on a photo. *This layout was inspired by prompt 43: Digitally alter the color of a picture. I colorized each photo by opening it in Photoshop, clicking on Image>Adjustments>Hue/Saturation, selecting the “colorize” box, and then adjusting the slider to change the color. *I went a little crazy and combined two prompts: 48 (create a digital photo collage), and part of 54 (add a title and journaling to a photo collage). Try combining prompts 48 and 54 yourself using the digital collage frame and title I created for my layout. 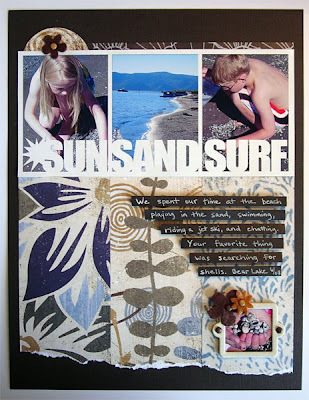 To download my free “Sun Sand Surf” photo collage frame CLICK HERE. I love love love Simple Scrapbooks, and would love to win a copy of this as I had not heard of SS back when it was released. This site is so awesome - keep up the good work guys! I'm always looking for new ideas and techniques for scrapping...keeps things fresh! Thanks for the chance! I don't have it yet, but I was looking at it at B&N the other day. It looks like it has lots of great ideas in it! Looks like something fun to try. Thanks for the review! Looks like a great book! Fabulous review Aly! I love idea books/magazines. Thanks for the chance to win. I am looking forward to checking this magazine out. Thanks for the heads up. I had not heard anything about it. I will probably head on down to the LSS today. I would consider getting this book just because of the price. This book looks great, and its a great price point! I hate spending a lot of money on an idea book. Looks like a great source of inspiration! Love what you've done with the prompts! Just wondering whether there were any creative prompts about minibooks? Ooh! This looks like a good idea book to have. Pick me, pick me! Yes! I love magazine specials like this! My hot little hands really want this! This is definitely something I want and would use. I love their special publications! I dont have this idea book but love looking at others work to get inspiration and ideas for mine own. I'm glad there are still publications like this being made...we're all a little worried about the scrapbooking business (loss of stores and magazines) and hope it continues on. Great inspiration! I could use an updated idea book. I like them, but feel they have a "shelf life" as trends change. I am addicted to idea books and haven't gotten this one yet. I have the first Scrapbook Play and it is terrific. Wow, I'm glad they still published this, even though they're no longer with us. LOVE that layout with the 6 different colored photos!!! I don't have this but it looks like something I could really get a lot of use out of. I like to get creative with my photos but often feel clueless where to start. I love the examples you gave. Thanks for the free download! I've heard good things about this idea book! Your examples are awesome too. Thanks for the chance to win! I would love to try some new things on mu pages. I've sort of stuck to the same layouts and this would be a nice fresh start! Scrapbook Play was my favorite special issue, too! I really hope I win this new issue, I haven't seen the darn thing in stores yet! Hmmm...seems like a cool book. Thanks for the great review and the chance to win. Love your review - thanks for the chance to win. I've had my eye on this issue for awhile, would love to win! i keep seeing this mag at walmart but haven't picked it up. after reading your review, i'll definitely have to check it out! unless i win a copy, of course, lol! Oh yeah..I'd be interested. I'm in such an emotional and creative block right now (my mom died recently) and I really need something to kickstart me. no, I haven't seen this version yet. Yes I would love to get it - and even at $6.99 US that's a great price too! Love the prompts that you've shown! wow that looks like a huge help!! i would love to have all those hints and prompts! I haven't seen this idea book yet...it looks great! I love the creative ideas you showed us...it really gets the ideas flowing! I have Scrapbook Play, and I LOVE it. I imagine this one to be fantastic as well. who isn't always open for new inspiration; it's so fun to see how clever other people are! Oh, you make it sounds SO good now I want one!!! I love your examples! Thanks for the review! Is the one pictured the original, or is the other, that is $14.99 but not pictured the orginal. It isn't clear to me which on is the sequeal on the site linked up... and though I would like to buy both, I want to buy the newest first. I don't have the book but after reading the review, I think it would be something I could definitely use. I love your review of the new book/mag. I would also love to win a copy! Thanks. Thanks for the review! Now I'm anxious to get my hands on it. If I'm not lucky enough to win one, looks like I'll be heading out to the stores on Friday to find it! I love this issue! My mom has a copy, which I got to briefly look at but I would really love to have my own. Thanks for the review, and great examples. The fact that Simple Scrapbooks best reflected my style of scrapping will make it sorely missed. I hadn't looked at this book while the magazine was being published, but I certainly will do so now. I was at the book store a few weeks ago and checked this out. I loved it, but decided to buy it at my lss. Went to the lss and they did not have any copies left! It was awesome, great ideas and even better awesome inspiration!! Now my only hope of owning this is to win it:) Thanks for the chance!! I love getting new books and magazines for inspiration - that new or different one can sure throw some "freshness" inot my style and get me motivated. This looks like a great addition to the arsenal! Always looking for more creative techniques and ideas! I would love to see what this magazine has to offer. Definitely interested in this one! The example that caught my eye right away was using the border punch on the edge of the photo, rather than on paper! LOVE that idea! So if this book gives me more ideas like this ... I am all over it! I do not have that idea book, but could desperately use some new inspiration! Thanks for your great reviews. Sounds like a book I'd love to have! I need some good creative prompts! Thanks for the review and I love your layouts! Love this idea. Thanks for the chance to win! I have this mag and ADORE it. There are more than the 146+ ideas in here, it inspires my LO every time I use it and it is just such a fun way to stretch the creative imagination...wish I didn't miss the 1st edition!! I would love the opportunity to win! thanks for all you do! I don't have the book - YET. This looks like a must-have - I love to play with photos and I love to scrapbook - so this seems to be perfect. I have not seen it yet. Would love to add it to my library. I don't have this, but would love to win one! I have been wanting to pick this up but haven't yet. I LOOOOOOOOOOOOOOOVVVVVVVVVVVVVVVVVVVED Scrapbook Play, so I sure would love to win this one!